Kyrgystan was under Russian influence until 1991. It became of the Soviet Socialist Republic of Turkestan in 1918, under the U.S.S.R., becoming the Kirghiz S.S.R. in 1925. In 1991, a number of the republics broke away from the USSR, and the CIS or Commonwealth of Independent States was formed. Its capital is Bishkek, formerly Frunze. 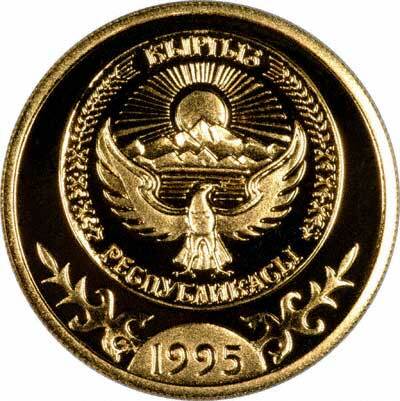 It should be quite easy to form a complete collection of the gold coins of Kyrgystan, as the only gold coin issued has been the 100 Som coin of 1995. Manas is an ancient national hero. 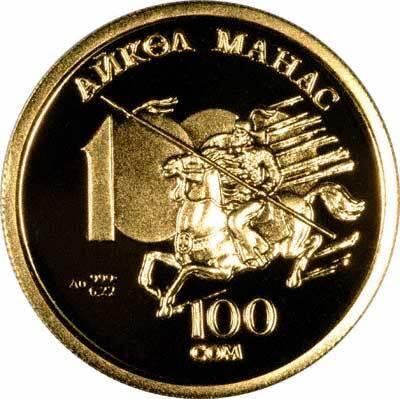 His image appears on horseback in the centre of the coin. "Manas kind-hearted" is the legend in Kyrgyz above. Below is the face value. MANAS EPIC 1000 YEARS legend along the top edge.